So this is a breakfast I make if I’m not feeling lazy. I also use some shortcuts to speed up the process since everyone seems to be hangry in the morning. But it is pretty delicious to have first thing on a rainy Saturday morning, like today. In a medium skillet, heat up canola oil. Saute onions until they become translucent. Then add the tomatoes (with the juice) and the chiles. Stir in the chili powder and simmer for 10-15 minutes. In a pan over medium high heat, I spray with canola spray and warm each tortilla individually. About 2-3 minutes on each side. I then take another pan on medium high heat and fry my eggs. I use a tablespoon of butter for each fried egg. I then microwave my bacon and the refried black beans (separately of course). I then plate my tortilla. Lather on a healthy portion of the black beans. Place my eggs on top. Then add a heaping spoonful or two of the tomato. And then I top it with some cheese and the bacon. So so so yummy! 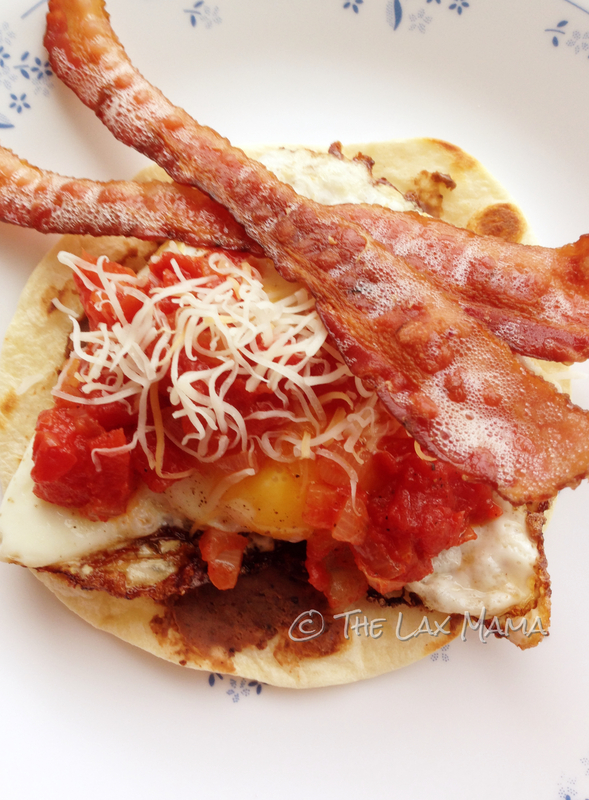 I know you are probably rolling your eyes about microwavable bacon and refried black beans. It makes expediting breakfast in a timely matter so much faster when you have a hangry husband and toddler. If you have the time, go for it and make things from scratch. I would probably bake the bacon in the oven before I started the tomatoes. But this meal can seriously be made in 30 minutes the way I do it. While my son has been eating this meal since he was 18ish months old, I wouldn’t call this a baby led weaning recipe per se. You can definitely give each component to your baby. The only reason why we didn’t do this as a baby led weaning recipe is because we put chiles and chili powder in the tomatoes, which sometimes can be a bit spicy for my now 3 year old. You can obviously eliminate them if you do want to make this a recipe fit for you 6+ month old child. However, it just doesn’t taste as good for the adults to add these crucial flavor components afterwards like you can with salt. I also give my son scrambled eggs instead of fried eggs.